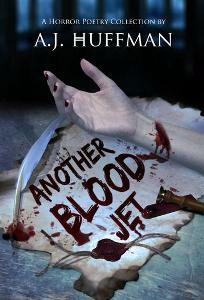 Another Blood Jet is a horror poetry collection by A.J.Huffman with a truly Gothic feel throughout. The 48 poems written in minimal language are easily accessible but full of meaning and depth. The poems take us on an emotional roller coaster of a ride through the speaker's life both real and imaginary. The recurrence of blood and visions of surreal experiences become increasingly unsettling and disturbing. If this is the narrator's real life it is a tumultuous one that fills us with disquieting feelings as we read on apprehensively through the collection dreading what might become of the narrator. Empathising with the writer we share her trauma through the twists and turns and feel her distress at the world she inhabits. In the opening poem Breakfast at Sunset we find the speaker exhausted and wrung out by what appears to be a relationship. She has given everything including her very heart and soul. It gives us an insight into her nature and how exposed she is. We feel protective for her and fear the worst. The recurring themes of violence ominously hang over the collection with little respite from the blood and death that dominate so many of the poems. In Honoring the Sequence again there is ambiguity, is this yet another destructive relationship graphically depicted or is it the shadow of death looming again? as finally she received 'his poisoned kiss'. I begin to wonder if all the poems that at first I have interpreted as being about failed human relationships are actually about the poet's relationship with death and acceptance of the inevitability of death for us all. In the final three poems we finally see some respite from the poet's trauma. In Afloat on a Sea of Fire she has the scars of her past experiences as she starts out anew. Maybe this time it will be different and she will feel find some respite from the distress that she has experienced, in a new life full of joy. This hopeful forward looking tone is continued in the penultimate poem, What You're Looking For. Here she is a goddess atop a pedestal. And so in the final poem Standing Still. Against the Rain. it is a relief to find that the poet has survived all the wrongs done to her against all the odds, it has been a journey of increasing adversity. The recurring angel has clung onto life, she recalls what it has meant to be loved despite all the tragedy she has endured and she has kept death at bay. On the final page of the collection it is a relief to see the smiling face of the poet. Madeleine Walton is a Sheffield based artist working with words, paint and collage.